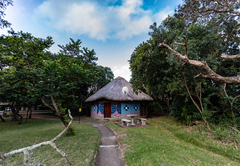 DumaZulu Lodge & Traditional Village is a highly recommended Hluhluwe hotel providing accommodation for tourists visiting the Zululand region. 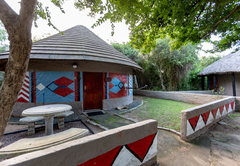 Situated in the heart of Zululand, near Hluhluwe, DumaZulu offers an authentic African cultural experience and accommodation in Hluhluwe. 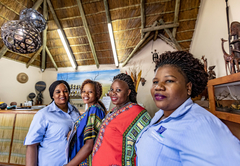 Each self-standing unit is designed to resemble different tribes of Africa, including Zulu, Swazi, North Sotho, Xhosa, Venda, Tsonga and Ndebele. 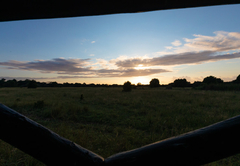 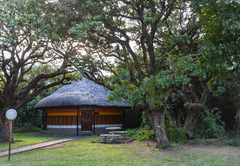 DumaZulu offers a natural and therapeutic outdoors environment for guests to reconnect with nature and replenish their senses. 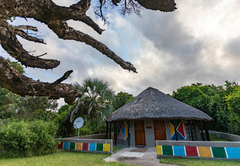 DumaZulu Lodge & Traditional Village brings guests to experience a unique African culture. 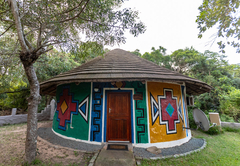 Guests may learn of this unique African culture and experience their traditions and passion for life in the heart of Zululand. 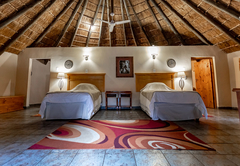 Each unit has decor adding rich colours of the earth to the interior, hues of burnt oranges, rich reds and browns add to the tasteful ethnic feel. 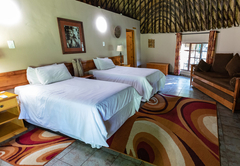 Each unit offers a comfortable, pleasant setting with en-suite bathrooms, air-conditioning, telephones and tea / coffee making facilities. 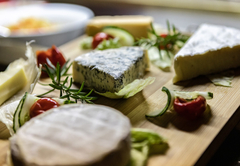 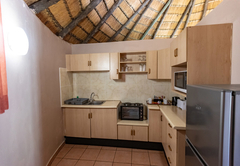 Another option is self-catering, with a kitchenette neatly built within the unit allowing guests to choose between home cooking and dining at the lodge restaurant. 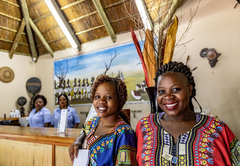 Enjoy relaxing in the outdoor swimming pool soaking up the Hluhluwe atmosphere and rejuvenate yourself by experiencing the true spirit of Africa. 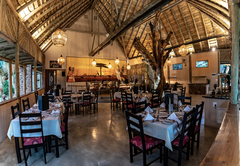 The restaurant and bar offer a relaxed atmosphere with traditional lunches on offer in our open air dining area. 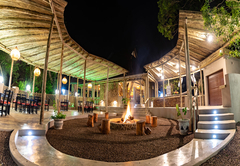 Dinner is a delicious affair followed by a chat around the boma fire. 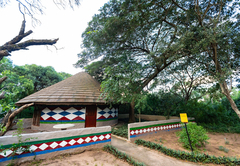 A visit to our Cultural Village is an experience of a lifetime. 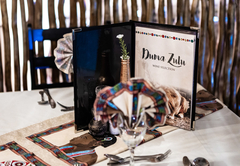 Discover the Zulu way of life and watch the pulsating traditional dancing with the taste of Zulu beer on your lips and the drumbeat of the Zulus echoing in your ears. 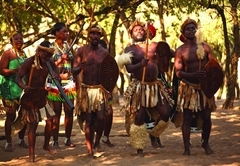 Not only is DumaZulu a cultural enriching experiencing for guests where they are afforded the opportunity to learn more about the rich variety of African cultures, but it also allows the local community to continue practicing their traditional ways of living and earn profits from selling curios. 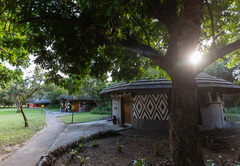 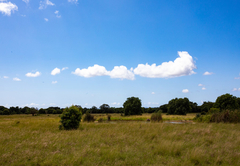 All products and produce sold on the property are made from natural products and are sourced from the land - 100 % green. 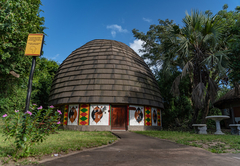 The cultural shows are performed daily at 08:15 and 15:15. 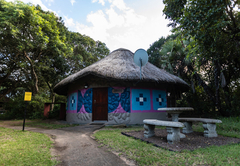 Enjoy the 11:00 show followed by a traditionally cooked Zulu lunch. 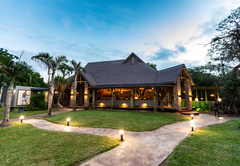 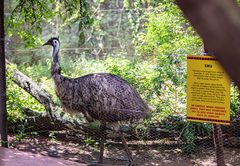 If you wish to get to know more of Africa’s wonderful people and creatures, then an added attraction to your holiday is to pop in at the on-site Reptile Park which offers the largest selection of snakes in Northern Zululand, crocodiles and numerous other reptiles. 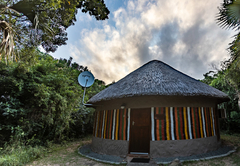 Response timeDumaZulu Lodge & Traditional Village typically responds to requests in 5-10 minutes.